My Baby Sound Spa Portable Review – Is this just what your baby needs? Does the My Baby Sound Spa Portable Really Work? Most new parents will check out almost every gadget on the market if they think it is going to provide some type of benefit for their baby. Perhaps the My Baby Sound Spa Portable may be one of these newer type products that should be given a closer look. 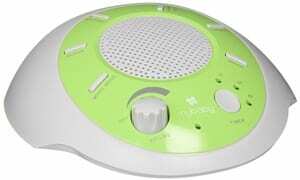 The My Baby Sound Spa Portable unit is a device that plays back sounds for your baby to listen and perhaps fall asleep to. It is comprised of white noise,heartbeat, ocean,summer night, thunder storm and a brook. You get to choose which one you think your little one would enjoy hearing. It has a timer on it that you can set for 15, 30 or 60 minutes. It is battery operated and requires 4 AA batteries. The company claims that the My Baby Sound Spa Portable unit will produce a comfortable environment for your little one. The unit is lightweight and easy to transport so it might be a great device for you to take with you when you and baby are on the go. The hype mostly comes from the many users who have put the My Baby Sound Spa Portable unit into action. Much of the feedback praises the ability of the unit to soothe the baby to sleep. It has received a 4.3 rating out of five stars based on 752 reviews. Its popularity has made it a number one best seller on Amazon. You can expect to pay $19.97 for this unit. Once you discover which of the six sounds your little one likes to listen to the most, then you just have to remember to turn the My Baby Sound Spa Portable unit on and choose the sound that you want, then set the timer. You may find that on occasion you will have to vary your choices if your little one gets too used to one sound and becomes bored. However, you don’t want to be going into the room at bedtime several times just to change the sound. This kind of defeats the purpose of calming the baby down so they can drift off to sleep. It makes sense that My Baby Sound Spa Portable unit would work when so many adults have purchased CDs that contain these various sounds for relaxation. Supposedly if you have some of these around the house then you could use these instead of buying the unit. This could be inconvenient, however. If the CD happened to end before the baby drifted off then no doubt they may let you know it with a few cries. Then you have to go in and replay the CD and start all over again. We are going to give the My Baby Sound Spa Portable unit a Thumbs Up rating. It makes sense that soothing sounds would help to relax a baby. Some babies have a tough time settling down, and all it takes is something soothing to listen to for them to be able to relax enough to drift off to sleep. Sometimes they hear other sounds in the house that might encourage them to want to stay awake instead of accepting bedtime. You might want to pretest some of the sounds first to see which one your baby is attracted to. You might find that the thunder storm sounds for example, work the opposite. Just play the sounds for a few seconds and watch carefully how your baby reacts. Then you will know which one is most likely to be the most successful come bedtime. We are all for any products that help make the babe’s life easier and the parents too. Another one that we thought was quite innovative was the bottle cuddler. What do you think? Does the My Baby Sound Spa Portable work or not? Does the Baby Jogger Glider Board Really Work? Does the Lollacup Straw Sippy Cup Really Work?